I come from a long line of seamstresses. My grandmother made all of her 5 girls clothes until they learned to sew for themselves. All of them learned from the master, my grandmother and she learned from her mother. My mom was the sewing 4-H leader for our club and she was an excellent teacher. If my seams weren’t perfect I had to rip them out and start over. It’s because of her perfection that I won so many blue ribbons in sewing at the county fair. I loved nothing better than to spend an afternoon looking through the Vogue pattern books and figuring out which fabric would look perfect for what I was sewing. I don’t sew for myself anymore. The patterns are so expensive and after you buy the material it seems cheaper and easier just to buy something already made. However I still like to sew on occasion and making gifts is what I enjoy doing. It seems like there are a lot of babies being born into my family and friends families this year. 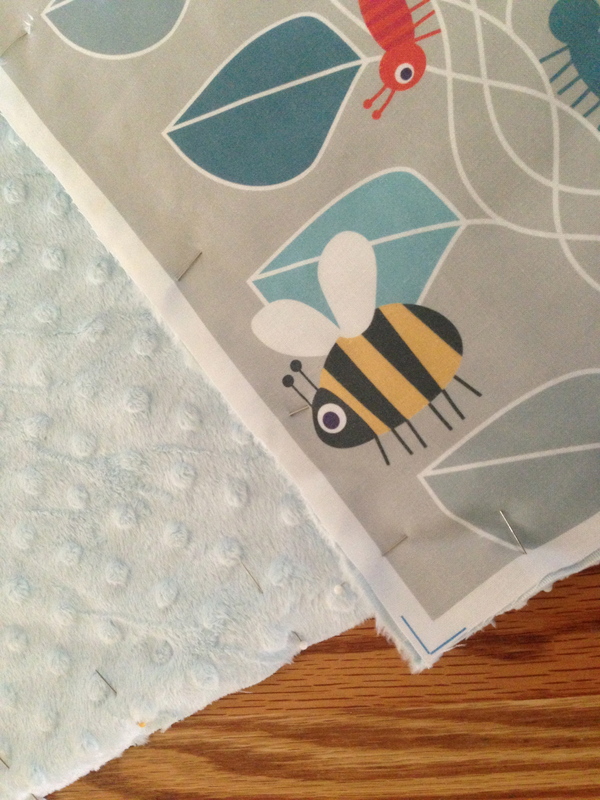 Last year when my nephew and his wife were expecting their first child I wanted to sew a blanket for their little boy. I looked at the fabric stores in my town and couldn’t find anything unique for little Bennett. 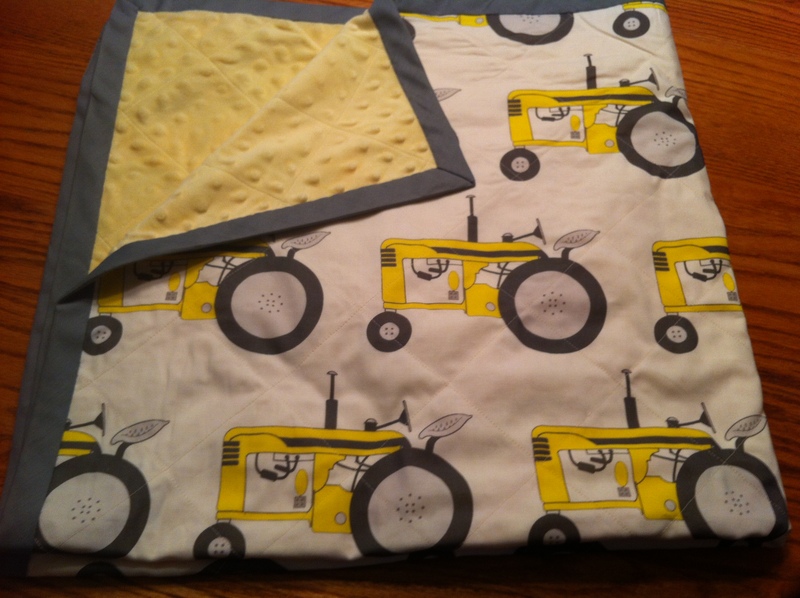 His nursery colors were white, gray and yellow and since his grandfather is a farmer I wanted a fabric with a tractor on it. I looked online and found a wonderful site at http://www.spoonflower.com/ . The reason this site has become a favorite is that you can just type in any word and all the fabrics with that description will be shown. You also have your choice of the design being printed on Kona Cotton, Combed Cotton, Poplin, Voile, Silk, Linen Cotton Canvas, Organic Cotton Knit, Cotton Twill or Crepe de Chine. Prices range from $17.50 a yard for the Combed Cotton to $38 per yard for the Crepe de Chine. The designs are created by independent fabric designers and when you purchase their fabric you usually get an email from them thanking you for your purchase. I especially like that personal touch! 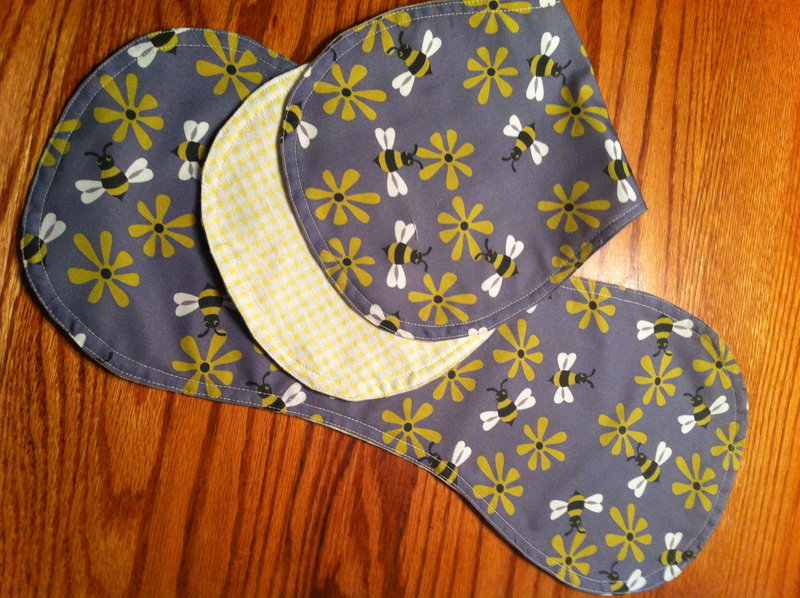 I also made Bennett some bibs and burp cloths with fabric from Spoonflower. 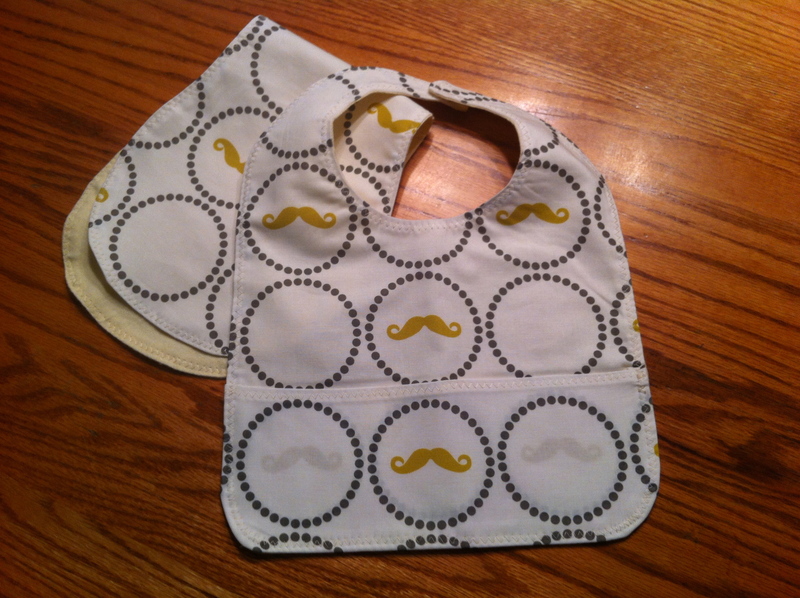 I loved this mustache fabric. 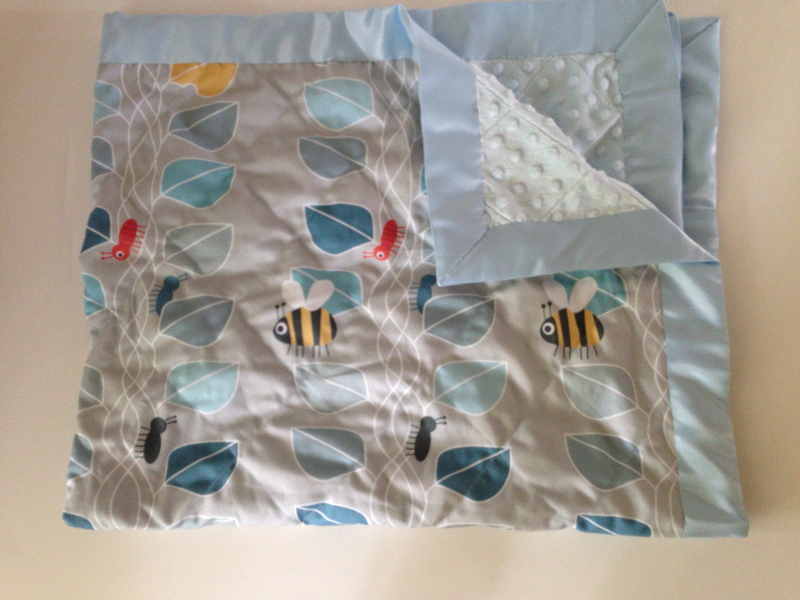 Bennett’s other grandfather is a beekeeper and the bee fabric was perfect. It seems that the majority of babies have been little boys. Out of the 6 blankets I made only one was for a little girl. Her nursery theme was lady bugs and I found the perfect lady bug material at Spoonflower. Unfortunately I didn’t take pictures of the other 3 blankets I made, but here is the link to the fabric on the website. 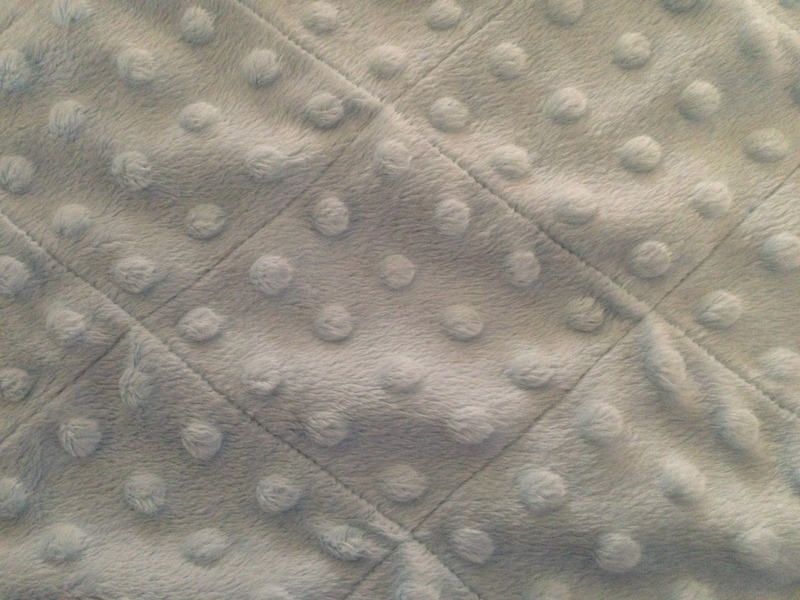 These blankets take 1 yard of the cotton fabric and 1 yard of a fabric called Cuddle Bubble that I purchased at Hancock Fabrics. I also used 1 package of blanket binding. The first thing I do is iron the cotton fabric so that it lays flat. I then lay the cuddle fabric with the wrong side up on a table then lay the cotton fabric with the wrong side down on top of it. 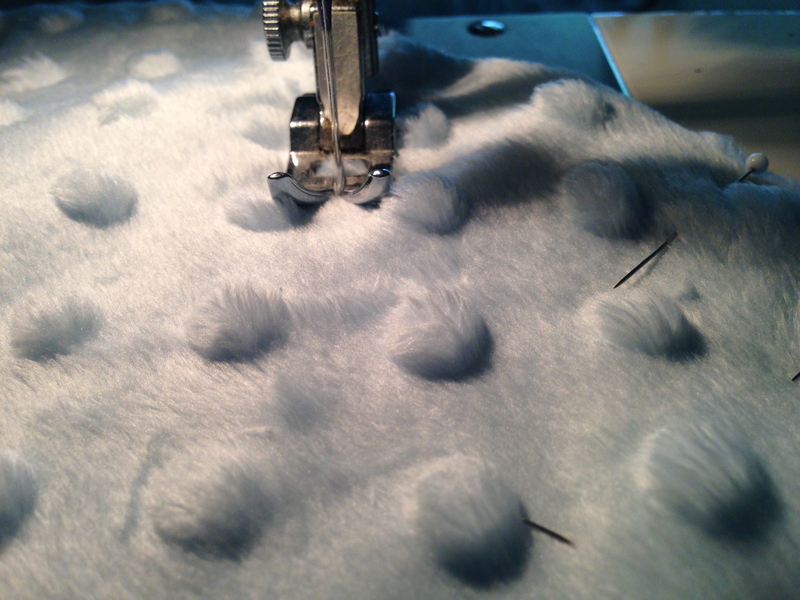 I pin the edges of the two fabrics all the way around. Starting at one corner I count 4 bubbles and sew a line. Then count 4 more bubbles and sew another line. Once you get the whole thing sewn going one way you turn it and do the same. This way you end up with squares of 4 down and 4 across. 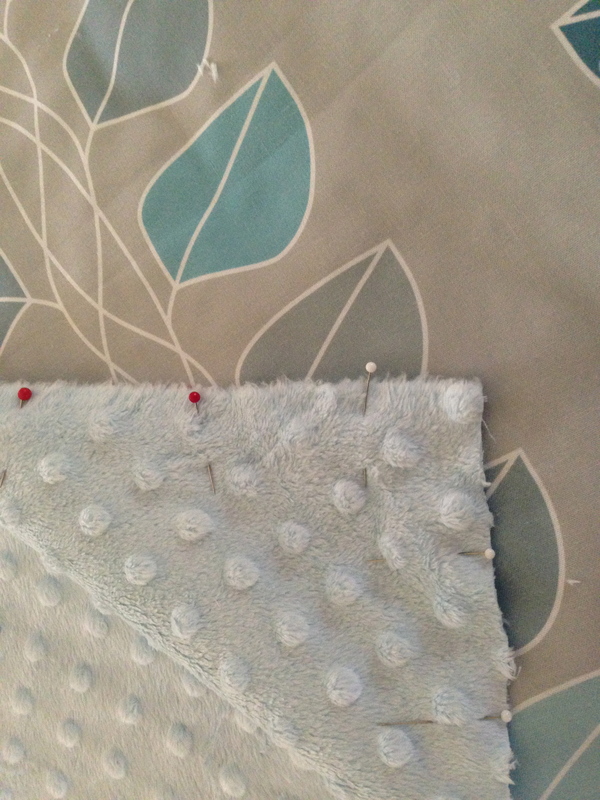 I then baste the binding all around the edge of the blanket and hand stitch the binding with a blind stitch. This is the finished blanket. Here is the other one. 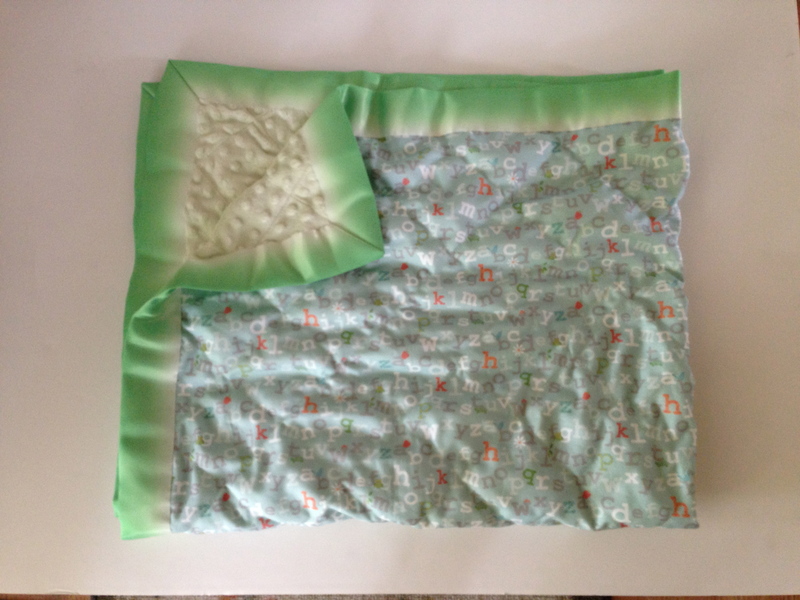 If you like to sew these are relatively easy blankets and they don’t need a pattern!